The Channel Islands of California are a chain of eight islands located in the Pacific Ocean off the coast of Southern California along the Santa Barbara Channel in the United States of America. Five of the islands are part of the Channel Islands National Park. The archipelago extends for 160 miles (257.5 kilometers) between San Miguel Island in the north and San Clemente Island in the south. Together, the islands’ land area totals 221,331 acres, or about 346 square miles. Five of the islands (San Miguel, Santa Rosa, Santa Cruz, Anacapa, and Santa Barbara) were made into the Channel Islands National Park in 1980. 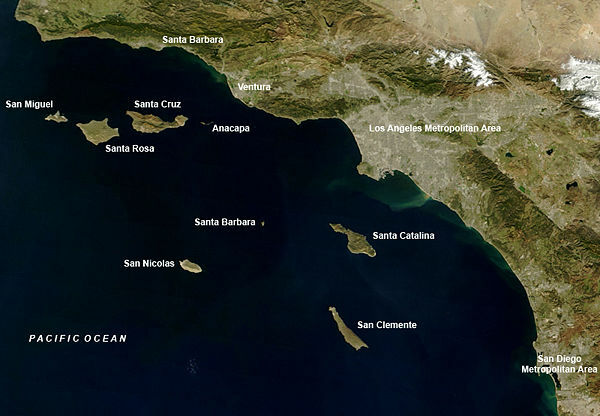 The Channel Islands National Marine Sanctuary encompasses the waters six nautical miles (11 kilometers) off Anacapa, Santa Cruz, San Miguel and Santa Barbara Islands. The Channel Islands at low elevations are virtually frost-free and constitute one of the few such areas in the 48 contiguous US states. It never snows except rarely on higher tops of mountains. Channel Islands National Marine Sanctuary is home to a rich and diverse community of marine life. The shoreline topography and currents in this region facilitate mixing of cool, nutrient rich waters from the north with warmer waters from the south, creating a biologic transition zone that brims with life.